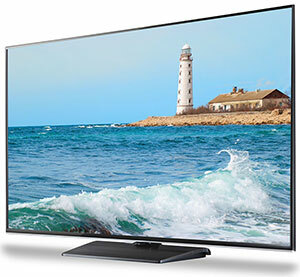 In today's marketplace populated with premium-priced, feature-rich HDTVs, the Samsung 48H5500 offers a refreshing, well-performing, easier-on-the-wallet alternative. Think of the 48H5500 as a modern day blue collar Joe or Josephine. The H5500 series TVs don't supply high-end items like an integrated camera or voice activation or even 3D playback, but the models do deliver a good looking picture. Of course in 2014, any self-respecting TV like the 48H5500 will provide integrated Wi-Fi and a long, long list of apps and streaming content partners. If you are searching for a solid, medium-sized, no-nonsense Smart TV, then the Samsung H5500 Series should be on your list. The standard for picture quality is constantly rising. A couple of years ago, a display like the Samsung 48H5500's would definitely have earned a 4.0 if not higher. Audio performance is firmly in the 3.5 range. The major features missing from the H5500 series (3D playback, voice recognition, motion control and a built-in camera) are not essential for enjoying a TV. As for the Smart TV features, Samsung has included all of the necessary bits, integrated Wi-Fi, apps galore, and Internet content providers like Netflix and YouTube. By taking out some of the features, Samsung has made the 48H5500 easier to use. On their website, Samsung lists the suggested price for this 48-inch 48H5500 HDTV as $1079. Currently they have it marked down to $749, which is in line with online retailers. Even at that reduced price, you can definitely find similarly-sized TVs. The features and performance of this Samsung Smart TV make it a good value. This holiday season perhaps we will see a deeper Black Friday reduction that would make the 48H5500 a real bargain.